At Acumatica, we understand that usability and customer satisfaction go hand-in-hand. Winning the CODiE Award for Best Cloud ERP Solution in 2018 (and in 2017) as well as for Best Manufacturing Solution tells us that our focus on meeting the needs of mid-size customers is spot on. I’m excited to announce Acumatica’s two most recent CODiE awards: Best Cloud ERP Solution 2018 and Best Manufacturing Solution 2018! This is the second year in a row that our true cloud ERP solution has been honored as the best at the SIIA Annual Conference and CODiE Awards in San Francisco, and to say we’re excited is an understatement. Our team is committed to giving our users superior business management software and these prestigious awards fuel our efforts. The Software & Information Industry Association (SIIA) is the principle trade association for the software and digital content industry. They have been handing out CODiE awards for 33 years, recognizing software and digital content organizations that shape the future of businesses in this digital age. Winning a CODiE is no small feat. SIIA has perfected a rigorous evaluation system with two rounds. The first round involves product demonstrations for two experts, which include industry executives and analysts, media outlet reps, bloggers, and investors. They determine the finalists, and their evaluations make up 80% of the overall score. SIIA members then vote on these finalist products, accounting for 20% of the final score. The winners are determined by combining the scores from both rounds. A total of 51 awards were given out in the Business Technology track for numerous categories, each one with its own stipulations. We were excited to win the CODiE award for Best Supply Chain Management Solution in 2016. The complete list of winners for 2018 is available now. Experts first reviewed the nominees for each category based on specific criteria. Acumatica’s cloud ERP solution meets each one fully. Winning for Best Manufacturing Solution is based on the fact that our Manufacturing Edition is a complete cloud manufacturing system that integrates manufacturing, inventory management, and accounting processes with real-time coordination across the entire business. 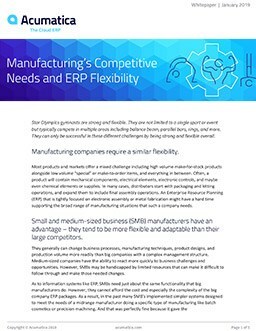 Our manufacturing ERP software gives users greater visibility and collaboration, the ability to manage product complexity responsively, and helps you control costs. Acumatica offers mid-size businesses an adaptable, mobile, and integrated solution with unlimited user licensing. Our ERP applications (Financials, Distribution, Manufacturing, Project Accounting, eCommerce, Field Service, and CRM) streamline your business management processes; our ERP implementations are handled expertly by an amazing team of VARs; and our growing team of ISVs build extensions to our cloud ERP platform, which provides role-based access and can be customized to meet your needs. Acumatica users can work anytime, from anywhere, on any device. All of this leads to Acumatica being recognized as the Best Cloud ERP solution for the second year in a row. Continuing to be the best year over year means we are never resting on our current success, which includes continuously improving our product for our customers through new releases, such as Acumatica 2018 R1. Two recent evaluations from leading research companies point to our success: G2 Crowd placed Acumatica cloud ERP highest in user satisfaction above three established competitors in their new User Satisfaction Ratings report, and the Gartner Magic Quadrant for Cloud Core Management Suites 2018 report recognized Acumatica’s high customer satisfaction. Both reports use actual user reviews. It’s an honor to be named the Best Cloud ERP and the Best Manufacturing Solutions for 2018. This industry recognition underscores our efforts to meet and exceed customer expectations. To see if Acumatica is the right ERP solution for you, you can contact our team of experts with any questions or for a free demonstration. You can also attend Acumatica Summit 2019, our annual event focused on accelerating business success through a modern cloud ERP. The Summit is taking place January 27-February 1, 2019 in Houston, Texas and registration is live. It’s the perfect time and place to see firsthand what we have to offer.